I saw this story posted on another automotive message board and I must say I teared up. Great work guys you guys rock! I remember how extraordinarily helpful and kind the general PFF populous was when was still active here and so hearing such a great story about what you guys did didn't surprise me that much. I wish I had caught this so that I could have sent in some money to help.. Anyway, I just had to dig up my old account and thank you guys for all of your hard efforts. Bravo guys, bravo. My thoughts prayers go to Tyler and his family. Hey Hulki nice to see you're goin home my friend .... yep this thread has fizzled down alot .. did you see the youtube of the swap? Hey thanks Daniel. It is soon time to go. I didn't get to watch the youtube video because our bandwidth is severely limited. I hope to watch it when I get back to the states. It would be nice to hear from Tyler after the swap though. You have your orders and next duty station yet? No orders yet. Next duty station Fort Livingroom, PA.
Duty would be family time I presume then..
All I can say is just wow, this is one amazing group of people! There was a link to a news story about this project for Tyler posted on the Black Mustang Club forums, and I have to admit that something must have drifted into my eyes when I was watching about what so many members of this club pulled together to do. One thing I've learned as a member of car clubs, although all of those are Mustang clubs (I know, I know!!!) is that true bonds can be created, even from just a website. As we like to say in the BMC, "It's the cars that bring us together, but the friendships that keep us together." What this club did, however, has me simply speechless. I haven't seen such a great effort by so many for such a great cause in a very long time and just wanted to register as a member of this forum to express my appreciation for helping out Tyler and letting him have a lot of enjoyment out of something he loves in the time that he has left with us. Gotta admit, us car people tend to stick together, and right here is proof!!! Never know, maybe one day I'll own a Fiero myself. Every car I'd owned prior to my Mustang was a Pontiac...and had my heart set on a Firebird but we all know what happened there. Anyway, if I ever DO get that Fiero that I've wanted since the 80's, then I would consider it a great honor to call myself a member of this club! WAY TO GO!!! And again, thank you for what you've stepped up to do as a club. It's definitely noticed and appreciated across all forms of car enthusiasts!! Cool that you came & found this topic and registered to say that. MustangTom, Thanks for stopping by and letting us know how you feel. We would love to have you buy a Fiero, although you don't need a Fiero to be apart of this group. You just need to be a car nut, there are lots of interesting threads going here (stop by the Off Topic if you get a chance.) But I would be willing to bet if you spend much time here you will find yourself with a 2 seater, mid engine, sports car in your drive way. I'm definitely a car nut...granted, a car nut with all the mechanical skills of say, a cabbage. And since part of me is still loyal to Pontiac (may she rest in peace) I do believe I'll be hanging around! Say, do we have any members in eastern NC? I would love to go for a ride in a Fiero. Been wanting to do that since '85! 2.5 The video was perfect ! Like someone else said before, some dust must have somehow floated into my eye at some point while viewing. Someone needs to submit the videos and the story to car crazy for sure. I submitted something to the big O. Hey guys! Just wanted to check in with you and wish all of you a very Merry Christmas! Tyler went for a drive with his friend Nate today in the yellow rig. He also took his brother out for a drive last night. Jay was outside listening to the boys... you could hear them a couple miles from our house really getting on the gas and "blowing out the carbon" as my Papa Cass always like to say. I have no idea what that means, but it sounds good Anyway.. wanted to let you know all is going good here as we are trying to get ready for Christmas. I have to say it is not without its difficulties... at least for this tired old mom. I am super happy to hear you are coming home Andy. What a terrific Christmas present for your family! I got a very nice email from your wife the other day too. We are still waiting on the flag delivery from the Guard but will be sure to post pics as soon as this happens. I am already trying to figure out where to put the flag pole in the spring so we can proudly display this for all to see. Thank you, Daneele, and you guys have a great Christmas as well. I won't be home in time for it, but I will have my own Christmas when I get back home. Weather permitting, I am still planning to be out in Frazee the end of January, around the 29th. Can't wait to see everybody! Merry Christmas! I am glad that things are going well... awesome that the brothers are getting to spend time together in the car. Welcome to the life of a technologically challenged person. I can't figure out how to get a picture to post on my message. I posted a pic of Tyler and the flag Andy sent on caring bridge so follow that link to check it out. I also posted a thank you note I sent to Andy's paper, the star tribune, st. cloud times, and our local paper as well is doing a follow up note. Thanks again everyone! Email sent I copied and pasted the Caring Bridge journal post to the forum. Tyler got his flag. Below is the letter I sent to quite a few papers including Andy's hometown paper and the star tribune in Minneapolis. Just in case it doesn't get where I sent it, I thought I would put it on here. Shipman family, and Tyler. Thank you all for being here today. Sadly, I am unable to make it in person, so I send these words instead. have known both the Shipmans and the town all of my life. which my fellow Pontiac Fiero enthusiasts helped rebuild Tyler's 1986 Fiero. by other people grew, so did my heart and my pride at being a US Soldier. I saw people I had never met come together with a singular vision to help a complete stranger. a local young man known for his good nature, his integrity and his honesty. strong and brave against a challenge that most of us can not imagine facing. this on their own, they have opened their hearts to all of the support and love that a town, a state, a country can give. and I am proud to be an American. You all have continually proven to me that my efforts in Iraq are not in vain. A nation's flag can be a powerful symbol of pride; a flag that comes with a story behind it can mean so much more. On Monday morning, a United States Flag was raised above this school, and has proudly flown since then. of Forward Operations Base Delta, in Al Kut, Iraq. young man who has given all of us so much. Pennock's Fiero forum, the HHC and and A Company 1-150th Air Assault Helicopter Battalion. It is presented in celebration of Tyler's courage and life. This is specvgirl - Hulki's wife. Whe my honey comes home from the sandbox, we will be taking a "weekend away" and can't wait to meet everyone. Give Tyler and your family the warmest holiday wishes from Andy and myself. I am looking forward to the day he comes home so we can celebrate all of the holidays he's missed. We are counting down the days! Merry Christmas and Happy New Year to the Shipman Family. So happy to hear that Tyler is enjoying the Fiero. Makes the Holidays a bit more special this year! Also would like to say Merry Christmas and Happy New Year to Andy and his Family. Very happy to hear you are coming home soon Andy. To the rest of my Fiero family, again, I wish you all a Merry Christmas and Happy New Year. Barbie Porter at the Frazee Forum wrote a quick yet very beautiful article regarding the US Flag that was flown for Tyler. While each flag represents equality, every flag is not created equally. Recently the Frazee High School (FHS) hoisted a flag flown aboard a UH-60 Blackhawk Helicopter that participated in a combat mission Nov. 8 out of Forward Operations Base Delta, in Al Kut, Iraq. Pennsylvania native Sgt. Andrew Weigle sent the flag, asking it be flown at the school before it was presented to FHS senior Tyler Shipman, who was recently diagnosed with a rare, aggressive cancer called synovial sarcoma. Andrew met Tyler on Pennock's Fiero Forum, a Web site for fans of Pontiac's two-seater built from 1984 to 1988. Tyler requested help rebuilding his car, which he wants to eventually pass down to his younger brother, Carter. Andrew understood Tyler's request on many levels - he owns a few Fieros and helped a family member battle cancer. Andrew offered to help rebuild the car upon his return from Iraq, possibly in January, but his fellow Pennock's Forum members decided the rebuild couldn't wait. In mid November, Pennock's Forum members from Minnesota, California, Florida and Texas visited Frazee and rebuilt Tyler's Fiero in two days. Andrew was able to watch the build and grand reveal via the internet, but decided to send Tyler a combat flag for his honorable battle with cancer. FHS principal Brian Koslofsky said the gift was befitting of the high school senior, as it represents courage and strength. "We were honored to fly the flag," he added. The school kept the fact it was flying a very special Old Glory Dec. 14-16 top secret to ensure it would safely be delivered to Tyler and his family, parents Jay and Daneele, and siblings, Carter, 10, Cassidy, 8, and Tiffany, 21. Two Minnesota Army National Guard Honor Guardsmen, Staff Sgt. Aaron Borgerding and Sgt. Nate Anderson, both of Moorhead, lowered the flag and presented it to FHS Vo Ag teacher Ken Hammer, who had Tyler in many of his classes. The flag was reportedly given to Tyler by members of his senior class, along with a senior class photograph. Staff Sgt. Andy Riewer, Frazee, who served in Iraq March 2006-June 2007, said flying a flag during a combat mission is extremely rare. "It isn't done very often," Riewer said. "And the fact they did that for Tyler (Shipman) is a testament to how they feel about him." Donations to defray Tyler's medical costs can be made at Frazee's United Community Bank. A letter . . .
My name is Sergeant Andrew Weigle and I am currently stationed in Al Kut, Iraq with E Company's 1st-150th Assault Helicopter Battalion. I do not know Tyler (Shipman) or his family personally, nor do I know Frazee directly, but I feel as if I have known both the Shipmans and the town all of my life. Many of you know who I am through the newspapers in your area and "The Tyler Project" in which my fellow Pontiac Fiero enthusiasts helped rebuild Tyler's 1986 Fiero. As you know, what started as a simple idea to help out a fellow car enthusiast blossomed into something above and beyond what I envisioned, and as the efforts by other people grew, so did my heart and my pride at being a U.S. soldier. I saw people I had never met come together with a singular vision to help a complete stranger. I saw a town that I have never been to united by this same vision. I saw many people rally around a local young man known for his good nature, his integrity and his honesty. I may be in Iraq, but Tyler has shown all of us what true courage is. Smiling in the face of adversity, Tyler has continued to be the same person he was before this all began. He has proven himself to be strong and brave against a challenge that most of us can not imagine facing. His mother's eloquent words on the Caring Bridge Web site (http://www.caringbridge.org/visit/tylershipman) have given me, and many others an insight into a close knit family affected by an invader. Rather than closing themselves off to deal with this on their own, they have opened their hearts to all of the support and love that a town, a state, a country can give. I am proud to know Tyler and his family, I am proud to serve, I am proud to protect our freedoms, and I am proud to be an American. This is no ordinary U.S. flag. This flag comes to Frazee from Iraq. It was flown aboard a UH-60 Blackhawk Helicopter on a combat mission on Nov. 8 out of Forward Operations Base Delta, in Al Kut, Iraq. The school has flown this flag as a favor to me, to show solidarity and support for a young man who has given all of us so much. I am proud to present this flag to Tyler through my brothers in arms at the Minnesota National Guard center in Detroit Lakes on behalf of the members of Pennock's Fiero Forum, the HHC and A Company 1-150th Air Assault Helicopter Battalion. Hey guys! Sorry I haven't posted much lately! Ive been watching, but with the college semester coming to an end (finals finals finals) then Christmas and running my coffee business I've been busier than Tiger Woods. Merry Christmas (belated) to all of you! I haven't talked to Tyler in a little while I think he has been busy with family/holidays which is expected. I know he is loving the car and so happy to get out and enjoy it! The day before Christmas some sweet laser cut hood panels came in!!!!!! WOW they look SWEET! Tyler is going to love them! I texted him the other day telling him about it. I think next week we will have to get together and put them on. I haven't looked to close, but do they just slide in? What does it take to instal? Miss you guys! You will see alot more of me now that school is done for the semester and my next set of classes isn't nearly as rigerous. Hey those decklid panels, yeah they are pretty self explanitory. With the deck open the factory ones are removed, I think the custom made ones are installed the same way as the factory ones. I believe those were made by Rich (silver 85 sc) here on the forum. These correct? Thanks everyone for keeping in touch here with what is going on. I enjoy hearing about it. Great to see Ty is enjoying the car. I hope to meet Andy (Hulki) someday too. Maybe at the 1st annual carshow in Frazee? Since I haven't had any complaints on them it should be a simple in and out. The last ones I tested were easily fixed with a grinder. Either way, can you let me know what you think I should change? Be sure to peel the pvc off and do something with the cut outs. They should come out easily. I hope Tyler likes them Fred thought he would. 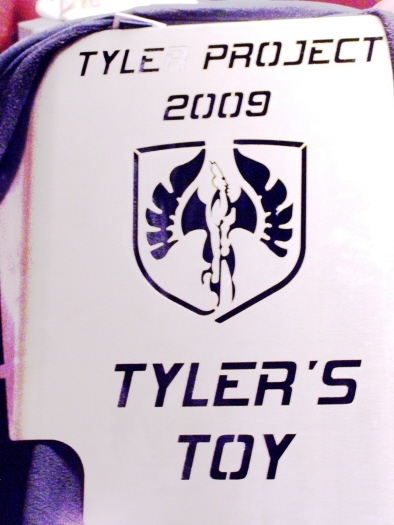 I did two dog tags for Tyler too, Fred was going to polish them, hopefully they are there or on the way. Well, as of now I am looking to fly in the 29th of Jan. And once we set a date for the car show in Frazee, nothing will stop me from being there. I'll be flying into Fargo since it is closer. Can't wait to have you here! Thanks, Nick. Can't wait to be there! When are you planning to drive there? I am flying in the end of January just because I only have a weekend, and because the roads will be bad. When the Tyler car show happens, I will definitely be driving there. Tyler is still making news! must hav a cold... my throat is sore and my nose is all stuffed up. "Thank you for the much-needed perspective and the reminder about what is really important - each other. "